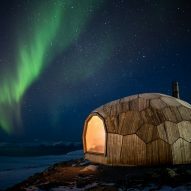 A wooden cabin with a prefabricated honeycomb-like structure, called Varden, has opened on Storfjellet mountain in Norway. 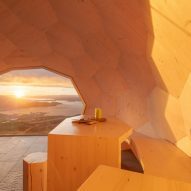 Spinn Arkitekter designed the shelter, which exists to encourage hiking in the mountains surrounding the town of Hammerfest, for the Norwegian Trekking Association. 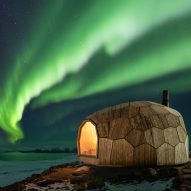 It has an "organic" prefabricated framework, developed in collaboration with Format Engineers to echo its rugged arctic setting, while withstanding harsh polar winters. "Varden is designed as a response to the surrounding arctic landscape in a way that blends it in with the mountains and rocks," James Dodson, partner of Spinn Arkitekter, told Dezeen. "We also wanted the design and construction to have a minimal impact on the site, and be built with sustainable materials." 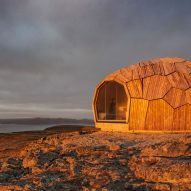 The cabin measures 15 square metres, and is built from 77 unique cross-laminated timber panels, which form a dome with a honeycomb-patterned shell. These prefabricated panels were designed by the Norwegian architecture studio to slot together easily "like a 3D puzzle", allowing a group of volunteers to transport and assemble the structure efficiently on site. Varden sits on a 300 millimetre thick concrete slab, and is accessed by a short ramp that leads up to decking sheltered by the roof. The door is set back from the edge of the decking to help the cabin remain snow-free. Inside, the timber panels help to create "a warm and inviting atmosphere" for the cabin. Light is provided only by a small wood fired stove with the help of candles and lanterns. It has a one large window overlooking the landscape, and features wooden benches that are integrated along each side of the structure, teamed with matching tables and stools. "Thus far the Varden has been a great success, and has increased the traffic to Storfjellet significantly," added the architecture studio. 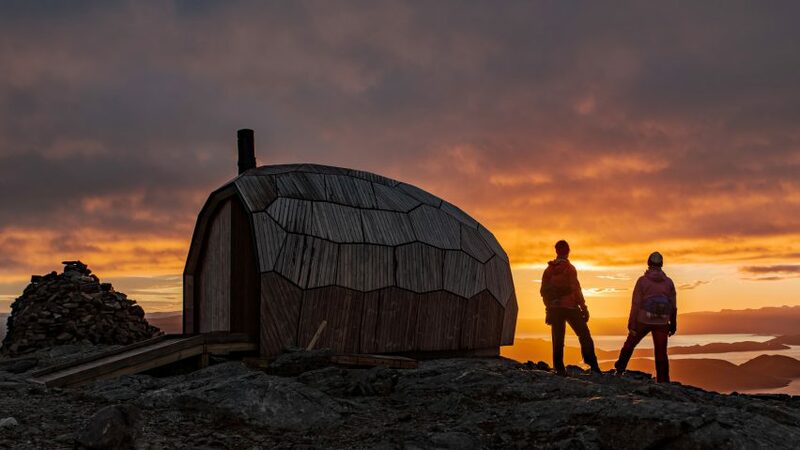 Later this year, Spinn Arkitekter will construct a twin cabin on Tyven, a mountain on the other side of Hammerfest. Italian architects Roberto Dini and Stefano Girodo also recently took on the challenge of designing a mountaintop shelter for hikers. Positioned 3,290 metres high in the Italian Alps, the Bivouac Luca Pasqualetti is made from four high-strength composite panels designed to withstand temperatures below minus 20 degrees celsius. Photography is by Tor Even Mathisen unless stated.